"Chai" with the Hamsa hand symbol. The Hamsa hand represents good luck and success in Jewish tradition and in many other traditions that adopted this sign. 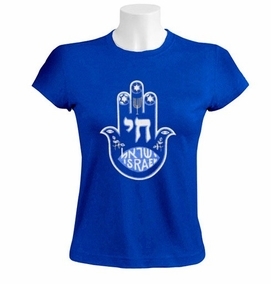 In this fine T-Shirt, there's a large emblem with "Israel" written in Hebrew and English. Our t-shirts are made of 100% cotton and are long lasting with bright colors. Our products are all designed and printed in Israel.